THOMAS HEDGES, PRODUCER, TRNN: In late January, Congress initiated talks on a little-noticed bill called 21st Century Cures. It’s a large deregulatory package that targets the way drugs are used and approved in the United States. The bill is being peddled as a spark plug to more innovation, but some warn that its real purpose is to get rid of a whole slough of patient safety rules. Vijay Das is a health policy expert at Public Citizen, who told The Real News that streamlining medical products is a frightening path to follow. VIJAY DAS, HEALTH POLICY EXPERT, PUBLIC CITIZEN: The 21st Century Cures package is a hugely deregulatory effort. This initiative is about a year old, and it’s being done in the name of providing more innovation to the FDA, and how we think about regulating drugs and devices in the 21st century. So for almost a year now, there’s been meetings in members’ districts, states, and on the hill, regarding how we think about bringing innovation to regulating drugs and devices. The one thing that’s oftentimes not discussed is patient safety. HEDGES: The deregulation effort is sweeping in its nature. It targets drugs and antibiotics in particular. It targets medical devices, and rules for how drugs can be advertised on Twitter and other online services. DAS: If you look at the contents of the bill, it’s seemingly completely consistent with what industry would like to see happen for their own benefit. The bill is largely about deregulating how clinical trials are done. So how are clinical trials done right now? They are seen as largely the gold standard in how we get drugs through. The world looks to them, in fact. And what this bill does is, in the name of innovation, it actually unravels a lot of the protections and creates these types of alternative pathways for drugs to get through the clinical trial process on weaker evidence. HEDGES: Das says that a weaker set of rules for approving drugs and medical devices points to more patient deaths, illnesses, and injuries every year. That was seen in the case of Vioxx ten years ago, when the Merck pharmaceutical company buried safety data about the drug in their submission to the FDA. DAS: The result of that was quite deadly. You know, we saw forty thousand people die. We saw lawsuits, we saw families being broken apart largely because of this terrible, terrible consequence of the industry having a huge say in how we approve drugs in America. And so, the $5 billion settlement should never have happened in the first place. HEDGES: In a list of the five worst provisions, Public Citizen outlined its other concerns with 21st Century Cures. For example, the bill also lengthens patents and drug company monopolies by extending the five-year limit of data exclusivity to fifteen years. DAS: And the reason it’s done is the companies complain that their R&D investments are so enormous that they need patent protection, they need monopoly protection, because there’s a lot of false positives in their process. And so … that doesn’t necessarily line up with what we’re seeing in terms of them making money hand over fist, year after year. What this bill does is extends their ability to market their patented drugs in a longer period, for a wider scope, with drugs they sponsor through the process. HEDGES: But health care advocates say the bill not only deregulates existing patient safety laws, it ignores and distracts many of today’s health issues that desperately need attention. One of the most significant is the looming threat of superbugs, which are microbial diseases that have grown in severity and resilience over the years because of the overuse of antibiotics, seventy percent of which are used in the meat industry. J.D. HANSON, POLICY EXPERT, CENTER FOR FOOD SAFETY: We cram chickens and pigs and cows so tightly together that if any one of them’s got an illness, all of them are going to get it. The way the industry solved that problem, by putting the antibiotics in their feed, before they need it. That way … you know, when you get really sick, you lose weight. Last thing that the meat industry wants is its animals to lose weight. HEDGES: J.D. Hanson of the Center for Food Safety says that ignoring antibiotics in livestock is a serious and overlooked health concern in the United States. HANSON: The animals are using the same kinds of antibiotics that humans need to use. The more these antibiotics are in the system, the more the pathogens that they’re intended to kill develop resistance to them. Some people make fun of people that don’t believe in evolution. We have a group in this country that does not believe in evolution. It’s the meat industry. They do not believe that these bacteria and spirochetes are going to evolve to resist the antibiotics. Where did they miss that lesson? You know, and their missing the lesson about antibiotic resistance means we lose drugs that we need to keep us well when we’re really sick. HEDGES: According to the Centers for Disease Control, some two million Americans are infected each year from superbugs, twenty-three thousand of whom die. Despite these figures, pharmaceutical companies, the meat industry, and even the FDA have almost done nothing to curb the spread of these diseases. In fact, many of the provisions in 21st Century Cures augment the risks. For example, some would deregulate the approval process for many medical devices, which if not carefully inspected and designed to be cleaned properly can carry these sorts of deadly diseases. DAS: And the best example of this is looking at what happened at UCLA just a month ago. So, at a UCLA hospital, there was a scope that had a superbug in it that was not approved by the FDA, that was widely used by this hospital. And without proper attention, and by poor management, we saw two people actually pass away, and a hundred and eighty people exposed to this deadly infection. And so the problem was that there was a specific area of the scope that was very difficult to clean. 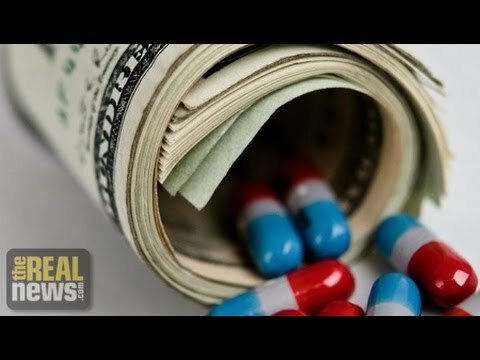 HEDGES: The bill also incentivises hospitals to use new antibiotics by handing out bonuses, stoking fears that doctors would overprescribe antibiotics for the sake of profit. That wouldn’t only put patients’ safety at risk, but accelerate the use of antibiotics even further. HANSON: If we’re going to have 21st Century Cures, we’ve got to close the loop. It’s got to include making law, all those things that FDA’s … you know, begged the industry to do voluntarily. We’ve got to quit dumping antibiotics into animals, and keep them only for animals when they’re really sick, not just for weight gain. Otherwise we’ll all lose weight when we get sick and die. HEDGES: The bill’s scope coupled with its absence in the mainstream media is prompting The Real News to publish a series of reports on 21st Century Cures, each of which will focus on one provision or issue within the bill. We encourage you to stay tuned and watch our future reports on a piece of legislation that would drastically change the way medicine is regulated in the United States. For The Real News, Thomas Hedges, Washington.